When people talk about curb appeal, most of the time the buzz words are covered porch, landscaped front yard, a unique door, windows, shutters. . . . How many times has the roof design figured in a conversation? Seldom or not at all, I’d wager. It’s time to move beyond the perception of the roof as a mere covering that protects a house and its occupants against the elements. The roof is more than that – because the right design can add character to a home and enhance its curb appeal. The question is, how does the roof type help define the overall look and style of a home? How can you choose from the many designs and shapes that are on the market – and be certain it is the right one that fits your home? Here are some ideas to think about that may make it easier for the homeowner to choose an ideal roof type for a new dream home. Curb appeal to the max! This 1-story, 4-bedroom, 3.5-bath Craftsman style home features a beautifully landscaped front yard with shrubs and colorful flowers, matching white columns, large windows, and an attractive gable roof, one of the most popular and versatile roof types (Plan #142-1185). 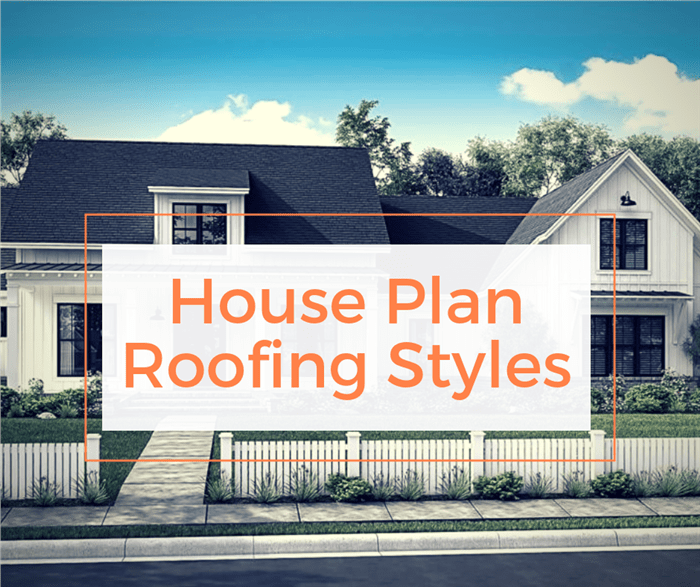 From the gable and its many variations to the hip, mansard, gambrel, flat, and salt box, potential homeowners have a lot of roof choices available to them. Roof styles vary from area to area, and the designs highlight the home’s architectural design, its uniqueness, and its functionality. You might even want to start your plan search by using “roofing type” as one of the “additional feature choices” in your search criteria – at least to start off. Often just seen as practical protection from severe weather, today’s roofs contain the home’s pipes, electrical wires, insulation, and ventilation and heating components; and they can affect the lighting of the home and reduce its energy footprint. 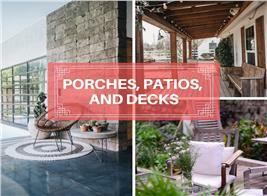 Some roof types add versatility to the home by providing the space for extra rooms. With all the factors to keep in mind when building a new house, choosing the roof presents its own challenges. In most cases, the architectural style of your dream home will dictate the roof style you will end up with. But in the end it’s your dream home and your voice, so you can modify any design you like with the roof of your choice. So before you decide on those blueprints – and possible changes – here’s a short guide to help you get familiar with and identify the best roof design for your dream home. 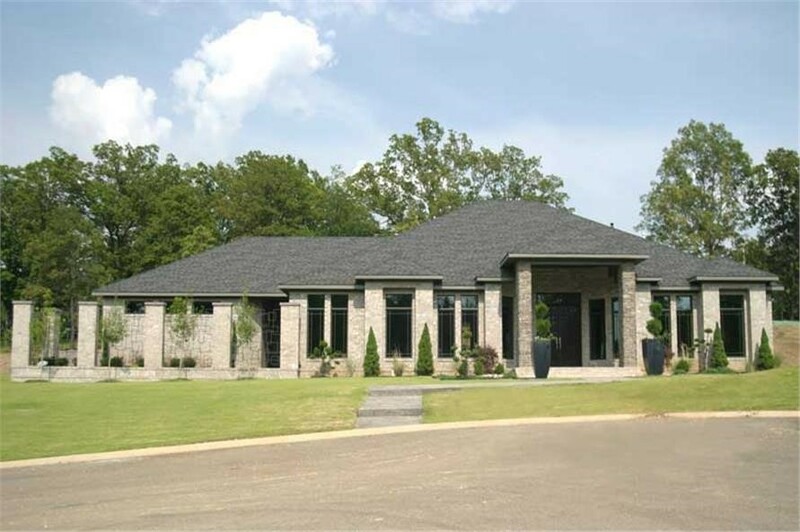 The contemporary design of this 3,374-sq.-ft., 2-story 3-bedroom, 2.5-bath home is enhanced by a hip roof made of asphalt shingles, columns that surround it, and shrubbery, including huge planters situated at the entry to the covered front porch (Plan #153-1808). The primary purpose of a roof is to shelter the home from high winds, water, snow, and other severe weather elements, so think about your location and the climate in that area. Certain roof types are better at enduring heat and impact, while others are good in shedding rain and snow. A roof type that looks quite spectacular on paper may not work in sections of the country with heavy snowfall or in hurricane and typhoon belts. Therefore, your choice should meet the demands of your climate to ensure reliable and lengthy protection. 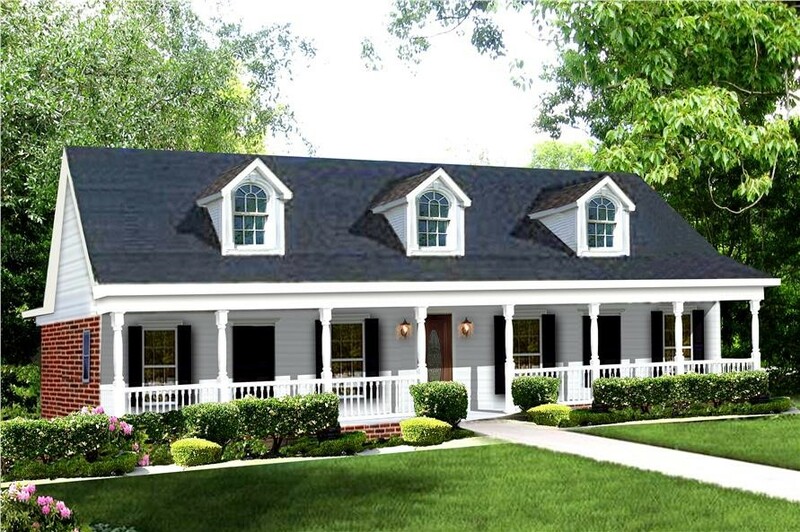 A gable roof – with dormers – as in this 1-story, 2,156-sq.-ft. Farmhouse style home with 4 bedrooms and 3 baths – is suitable for locations that experience rain or snow. The roof's pitch allows water to shed quickly, therefore avoiding leaks and damage (Plan #123-1039). Obviously, a budget always figures into any major project. Costs – much like the climate – vary from one area to another and will depend on roof size (square footage), slope, and architectural design of the home, geographical location, code requirements, and number of skylights, dormers, chimneys, and appropriate materials. Plan on spending as little as $4,500-$7500 (National Average) and as much as $30,000 for a roof. What else do you have in mind for your roof? Will you use it for extra living space (loft sleeping area), storage (attic)? 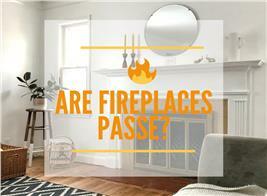 Are you looking for energy-efficiency and durability in addition to aesthetics and affordability? Your needs – as you define them - will ultimately dictate the choice of a roof type for your dream home. Here are the traditional roof shapes/combinations most commonly used in today’s homes – with their advantages and disadvantages. With its inverted, or upside down, “V” shape, the gable roof is one of the most popular in the U.S. and the typical choice in cold and rainy areas. The gable roof’s varying pitches, or slopes, allow architects to incorporate it many styles, including Craftsman, Contemporary, Colonial, and Tudor. 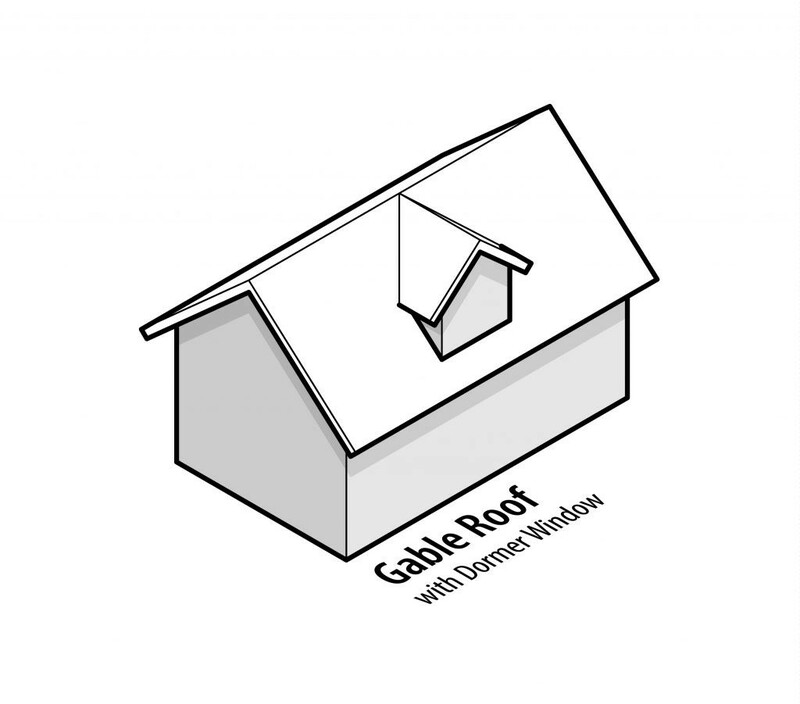 Gable roofs often have dormers built into them, which themselves may be built with a gable roof or a flat roof known a shed style (more on this later). A gable roof easily sheds water, snow, and debris, and it provides more ventilation in the attic. Because of its simple design, it is easy and relatively inexpensive to build. However, a gable roof is not great at withstanding high winds and hurricane forces. At the very least, a gable roof must be reinforced with hardware called "hurricane ties" to withstand high winds. And if the roof framing members in a gable roof are not constructed with adequate supports like collar ties, the roof can collapse. The illustration depicts a gable roof with its two sloping sides that meet at the top. The dormer is a focal point of interest (courtesy of Engineering Feed). More stable than a gable roof, a hip roof is suitable for both high-wind and snowy areas. It has slopes on all four sides that are uaually equal in length and come together at the top to form a ridge. The inward slope of all four sides makes a hip roof more sturdy and durable. And a hip roof can take on different looks depending on its slope, from the shallow, low-slung look of the Prairie and classic California Ranch styles to the steeply pitched, majestic look of European and many transitional Ranch styles. Hip roofs can allow for plenty of ventilation and the space for vaulted ceilings or attics. Two variations of hip roofs are the half hip roof and the Dutch gable roof. A half hip roof is bascialy a gable roof with the tops of the gables on each end clipped to look like a hip roof. A Dutch gable roof may be considered to be the opposite: the bottom of the roof looks like a hip roof but the top morphs into a gable. Images of each appear below. Hip roofs are more expensive to build because their complex design requires more building materials. The additional "seams" of the hips and ridges can make it easier for water to seep in and create leaks if a roofing system is not properly installed. 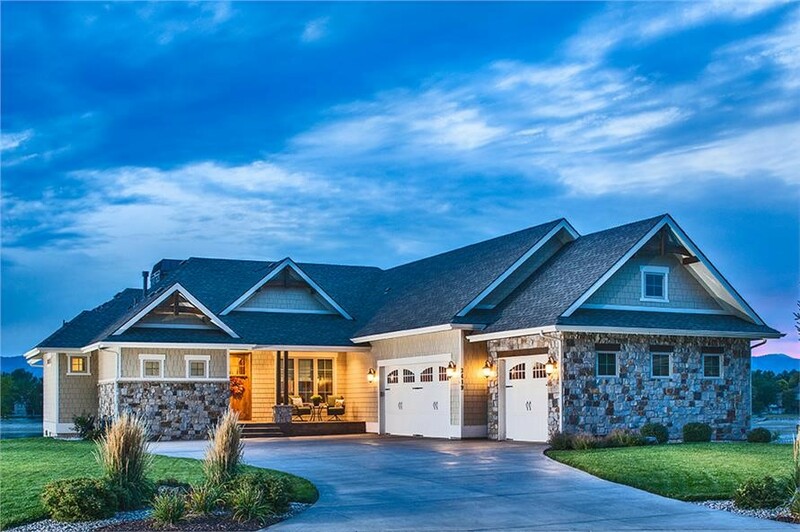 Top: While most often seen in European, Prairie, four-square, and many Ranch homes, hip roofs are also popular in designs such as this 2-story, 4-bedroom, 4.5-bath Contemporary style house, whose roof design extends to the 3-car garage (Plan #107-1015). 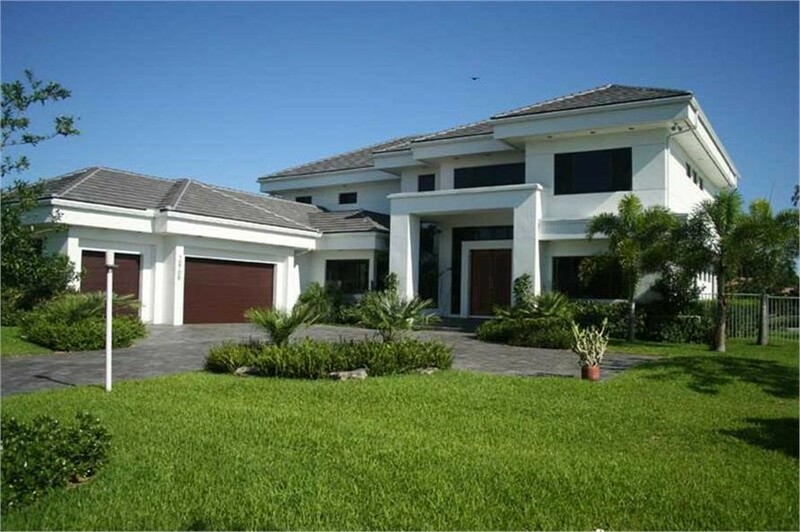 Center: This Coastal style home features half hip roofs on the house proper and the detached garage. The gable ends are "clipped" for the classic half hip look on the garage and both ends of the house but not on the dormers (Plan #116-1073). 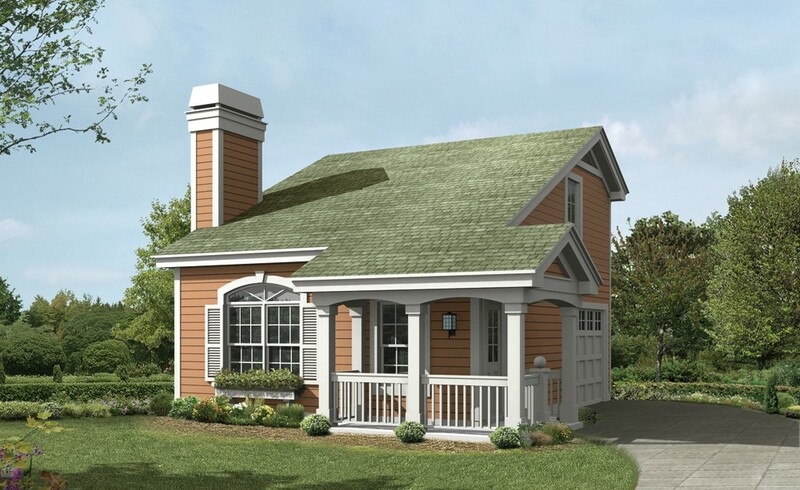 Bottom: This 3-bedroom, 2-bath Cottage style home has a Dutch gable roof (Plan #200-1009). Described as the French version of the gable, the mansard roof was named after French architect Francois Mansart, who used the design in Paris townhouses and chateaus. The mansard is a four-sided roof with a double slope on each side. The top of a mansard is usually flat (sometimes has a very shallow, almost unnoticeable pitch) while the lower slope is quite steep. The style helps create extra living space (attic or garret) and lends itself to open or closed dormers for more visual appeal. A mansard roof is difficult to construct and costs more because of the details and embellishments that go with building it. Today, these roofs are occasionally used in one-or-two-story apartment buildings, restaurants, French Manor, or Country style houses. 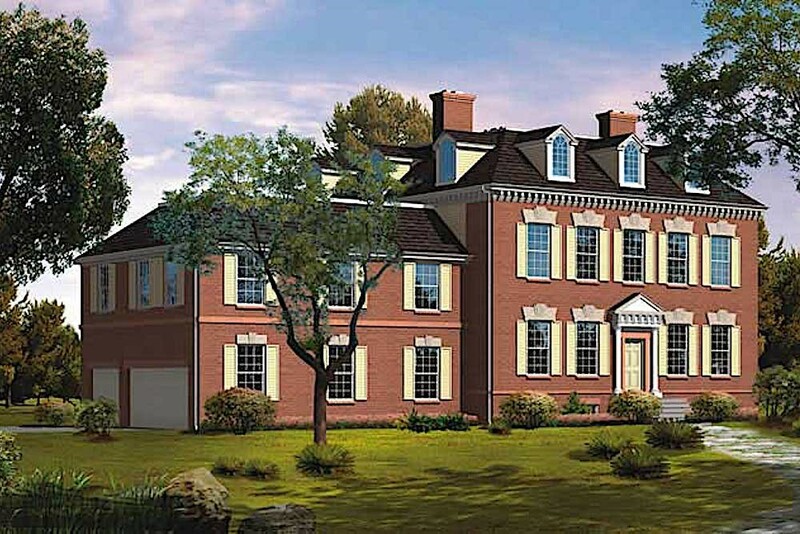 Here’s a rendering of a gorgeous 5-bedroom, 3-bath, 2-half-bath Colonial Georgian style home featuring a mansard roof with three dormers in front and three more on the left (Plan #137-1322). Usually a symmetrical two-sided roof with the upper slope positioned at a shallow angle and the lower slope with an almost vertical steep. This design provides the advantages of a sloped roof while maximizing headroom inside the building's upper level and shortening what would otherwise be a tall roof. While gambrel roofs allow for more usable space, they are not recommended for heavy wind regions that get a lot of snowfall. The open design can cause the roof to collapse under extreme pressure. Gambrel roofs also need to be waterproofed at the ridges and maintained on a regular basis. 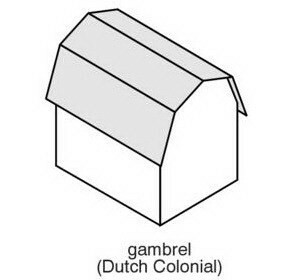 The gambrel roof with its two sloping sides is depicted in this drawing (courtesy of Realtor Mania). 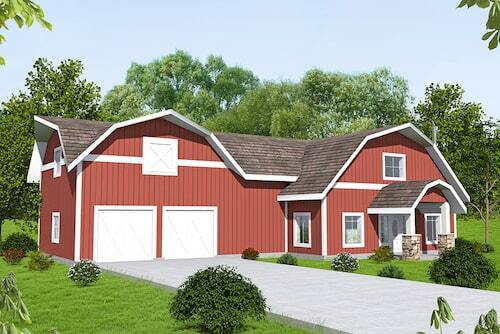 This 2-story, 4-bedroom, 3-bath home with Dutch Colonial touches was inspired by the classic red barn with gambrel roof (Plan #132-1656). While appearing flat, these roofs may have a slight slope to allow for water run-off and drainage. Flat roofs are generally used on industrial or commercial buildings but have been used in Modern style homes. This design provides extra living space on the roof for a patio, garden, or partially-enclosed penthouse room. In commercial roof designs, HVACs are placed on flat roofs. They are easy to build and conducive to installing PV solar panels for a more energy-efficient home. Because the low pitch makes flat roofs susceptible to water leakage, flat roofs are not ideal for high rainfall or snowfall areas. Although the upfront price tag for the construction of a flat roof may be less than most roofs, maintenance, ongoing repairs, and replacement costs may be more expensive in the long run. 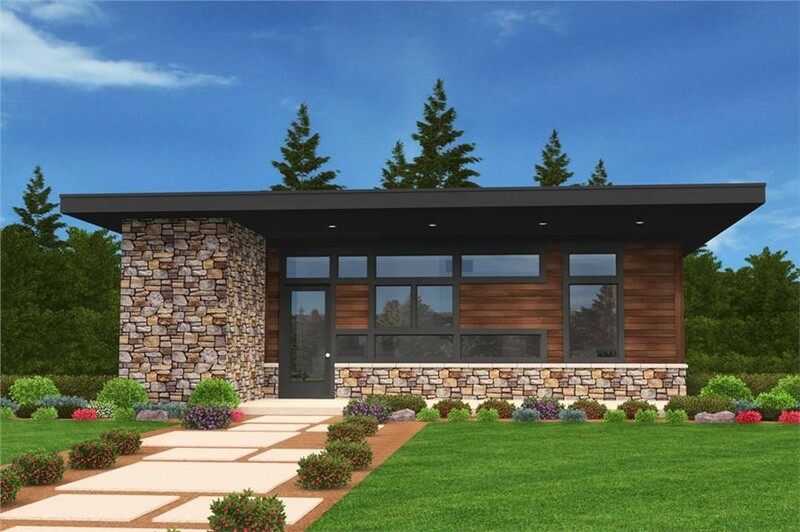 This spectacular 2-bedroom, 1-bath Modern home has a very simple and minimalist flat roof that complements the rock/stone and wood siding exterior (Plan #149-1886). 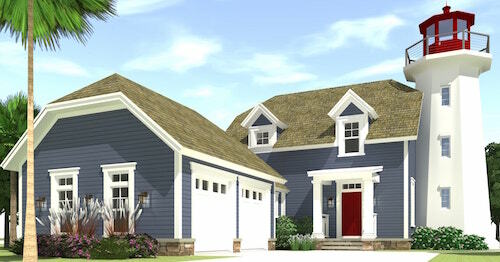 A variation of early Colonial and Cape Cod designs, this asymmetrical design has one side that's more of a slightly sloping flat roof and the other that 's more of a lean-to. In Colonial times, the early settlers realized they could add more space with less material by adding a lean-to roof to an existing gable roof. The salt-box roof’s asymmetrical design makes it more durable than a simple gable roof and adds more living space by extending the home to one-and-half to two stories. However, the design has higher building costs and often has rooms with slanted ceilings. 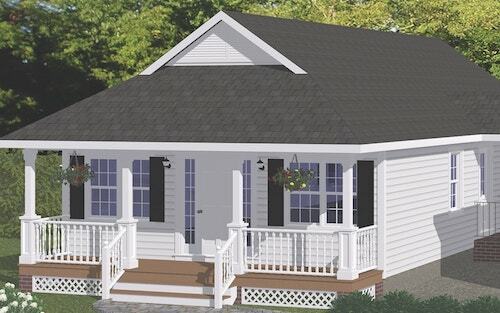 A rendering of a 1-story, 1-bedroom, 1.5-bath Colonial style small home comes with a saltbox roof that was very popular with the early settlers in New England (Plan #138-1233). Sometimes referred to as a lean-to or skillion roof, the shed roof is a single, sloping roof that can also be described as an angled flat roof. Its simple form is attractive to architects and builders who focus on minimalist designs. Shed roofs are easy to build and use fewer construction materials. Their pitch allows snow and water to easily run off. Shed roofs can be problematic in high wind regions. 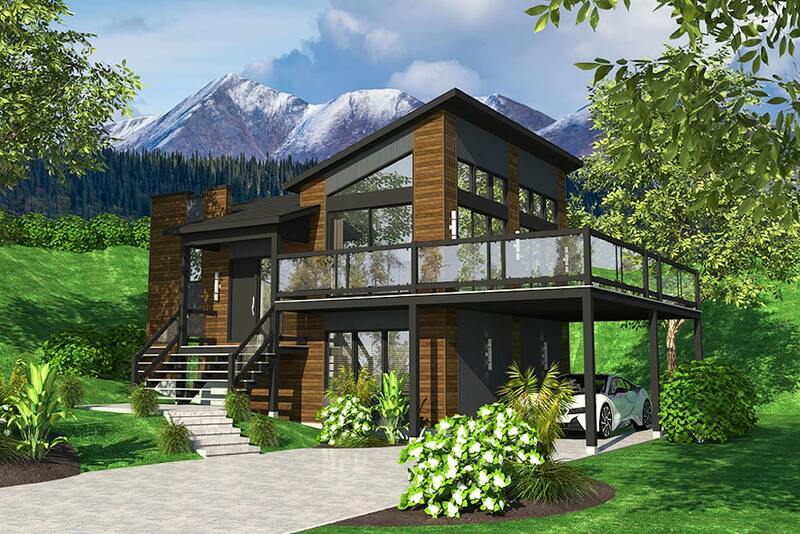 Quite striking in its simple design, this 4-bedroom, 2-bath Contemporary style home uses a shed roof for the main residence and the garage to enhance its minimalist tones (Plan #158-1319). A variation of the shed roof is the "double shed," in which two more more roof planes on the house slant in opposite directions. A double shed can also be seen as a deconstructed gable roof, with the two planes of the gable appearing a two separate planes, one higher than the other on a contemporary home. 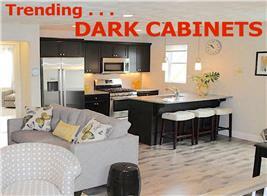 This 2-bedroom, 1-bath, 1-half-bath Contemporary style home has a double shed roof. The smaller, shallower roof is a bit higher than the longer, steep roof. It is a kind of deconstructed gable or slat-box style roof (Plan #138-1306). The gull-wing roof's unique shape – an inverted gable that looks like a seagull’s’s wings in flight – made it a defining characteristic in many mid-century modern homes. Today, the gull-wing roof is most often the design of choice in modern, eco-friendly, and tropical homes. While it is visually stunning, the gull-wing roof presents challenges in the complexity of its design and maintenance costs. Drainage systems can clog up and cause water to leak. Over time, this may weaken the structure and cause the roof to collapse if not maintained carefully. But for sheer beauty and clean lines, there’s nothing like the gull wing. Using a combination of roof styles can create an interesting architectural profile for a house. 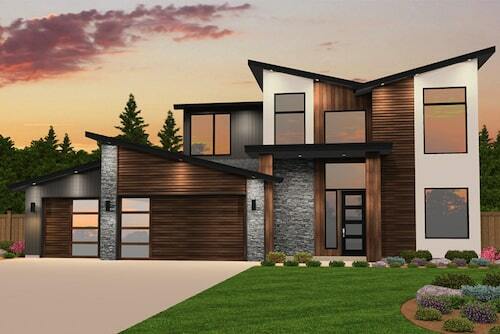 This 4-bedroom, 3.5-bath Contemporary style home makes use of flat, shed, and – on the right-side 2-story section – gull wing roof styles (Plan #149-1842). Just as there are a variety of roof shapes, so are there a number of roofing materials, including asphalt composite shingles; metal, clay, or concrete tile; slate; and wood shingles and shakes. Your choice depends on the shape of your roof; steeper slopes and flat roofs each require different materials. For example, you can't use shingles, shakes, tiles, or other any piecemeal, non-continuous roofing material on flat and very-low-slope roofs; you need to use sheet-like roll roofing or metal for a flat surface with minimal overlaps to eliminate or nearly eliminate the possibility of leakage on the shallow surface. And remember that the weight of the materials must complement the structure of the new home. 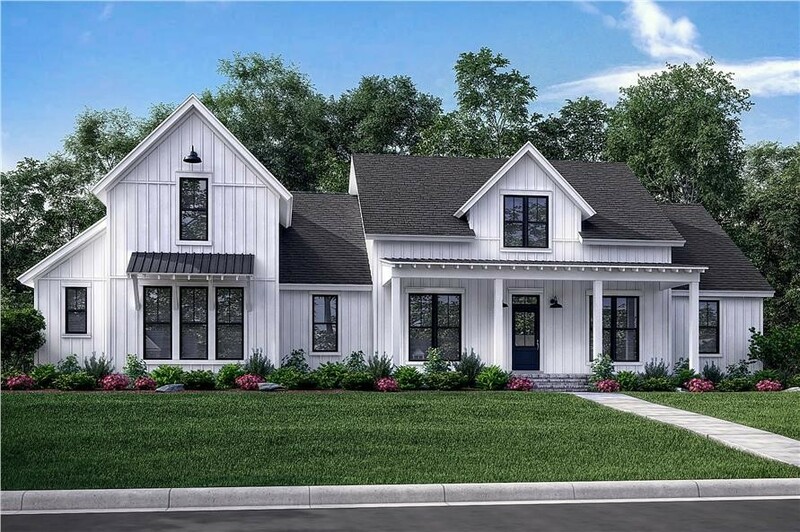 This 1-story, 3-bedroom, 3.5-bath transitional style home with Craftsman touches features a very striking gable/hip roof combination (Plan #161-1081). Use some restraint when designing your roof. Keep in mind that simplicity is beauty. You can create an interesting and attractive roof by going with the more traditional choices. 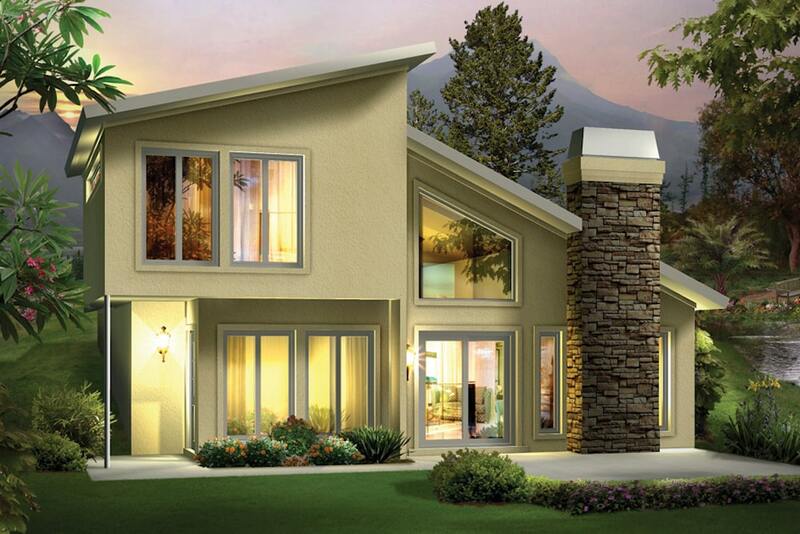 If you want to combine designs, go for the integrated gable/hip combination. Otherwise, just stick with just one eye-catching roof type for your home. While choosing a roof design for your new home may be difficult, try not to get overwhelmed by the challenge. Instead, make it interesting and fun by preparing well and paying attention to details.